I received these treats for free in exchange for my honest review. All opinions are my own. Well, and Truman and Wilson's. Our dogs noticeably love fall. It is easier to get them outside to play, they love going on walks and actually beg for more. 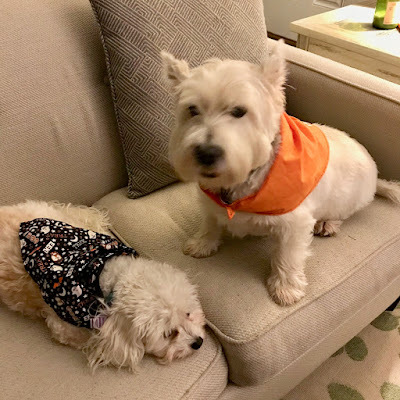 Truman even likes wearing his Halloween scarf. I am sure it has to do with the geese that come and live on our lake and the cooler walking weather. Whatever it is, when they return home, the first thing they do is run to the treat can. Why? Because they are madly in love with Fruitables Whole Jerky. Open a bag of Fruitables treats and you will immediately smell the difference. At Fruitables, they make treats that taste as good as they smell. Warning — Fruitables Whole Jerky may cause your dog to drool, tremble, howl, and show a sudden increased interest in everything you are doing — don't worry, these reactions are perfectly natural! Bison is a dark, protein-rich meat with a sweet taste. This healthy alternative is more nutrient dense than other red meats and offers an aroma and rich meaty flavor that will drive your dog wild! Fruitables treats come in different textures and a variety of flavors as broad as the rainbow — go ahead, explore the deliciously healthy world of Fruitables! These are a good kennel treat because they last for a while. Wilson, who gulps his food, settles down for a nice chew with these treats! Hurry, because these treats are on sale for $8.99 a package!